ON April 28, 1979, a former postman was crowned champion of the world. The story of how a 31-year-old won only the second professional tournament he’d entered is now part of snooker folklore. Just under seven weeks after Terry Griffiths beat Dennis Taylor 24-16 at The Crucible, baby Pascal Richard came into the world. When their paths crossed 33 years later, it saved Richard’s snooker career. “Terry didn’t do any specific coaching with me as such because I was there to improve my coaching – not my playing. But talking through a lot of snooker stuff with him made me realise in how many ways I’d been going wrong, especially in the mental department. Richard’s remarkable run in April kicked off with a 3-1 victory over Paul Foster in the final of The News Championship at the Village Snooker Club. 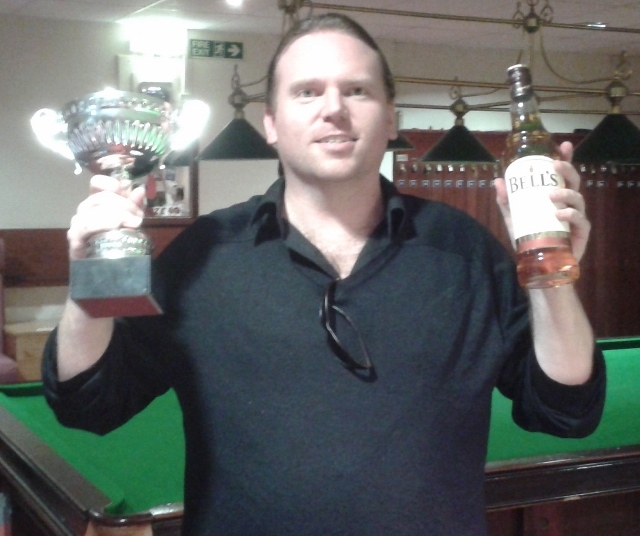 Then he was crowned the Portsmouth District Billiards & Snooker Association champion after a final at Portchester Social Club which he described as “probably the best quality match I’ve ever been involved in”. The 2011 and 2013 champion Mike Talmondt, playing in a fifth successive final, raced to a 3-0 lead. And at the end of the month, Richard returned to Stubbington and completed the hat-trick by whitewashing Jordan Winbourne 4-0 in the final of the Gosport & Fareham Snooker League’s scratch competition. His 18-year-old opponent had won the title for the past two years. Richard, the 2005 champion, had thought his name was on the trophy after a dramatic 3-2 victory from 2-0 down against Scott Stoneage. And he added: “Bearing in mind I’ve not looked anything like winning a scratch singles tournament in many years – some combination of yips and lack of confidence – to win all three was something that I’m pretty chuffed with. “It’s interesting that I played so well in winning that doubles tournament last year with Chloe (White) literally a few weeks after that spell in Wales. Incidentally, three times during these competitions, Richard successfully utilised his “new favourite shot” given to him by former professional Jason Weston. It’s the full length of the table double in black-ball games with enough pace to leave the ball on the side cushion if the pot is missed. Richard runs the Cuestars Section at Copnor Snooker Club, Portsmouth, and has revealed plans to start a Section at the Village Snooker Club on June 1. Picture by Steve Toms: Pascal Richard with his Portsmouth trophy.